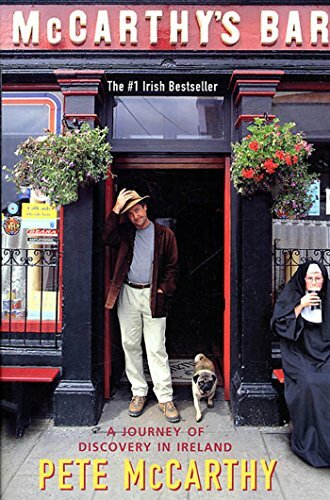 The premise of Pete McCarthy's first book is that you should never pass up the opportunity of having a drink in a bar that shares your name. There is clearly more to this plan than the obvious publicity stunt, since it seems to work with books as well--my favourite author is Cormac McCarthy and, after reading this hilarious, informed and intelligent book, I am tempted to buy books by every other McCarthy around. Born in Warrington, Pete McCarthy decides to go back to rural Ireland, to rediscover his Irishness. The feeling that you have heard this sort of thing all before doesn't last for long. There is a serious writer struggling to make himself heard above the many excellent jokes and this is what makes McCarthy's book so distinctive. Although he can crack Brysonesque quips with the best of them ("I've often wondered how businessmen used to cope before [mobile phones] were invented. How did they tell their wives they were on the train? "), and take us through hilarious and largely drunken set-pieces, McCarthy is equally at home discussing Celtic standing stones and the potato famine.